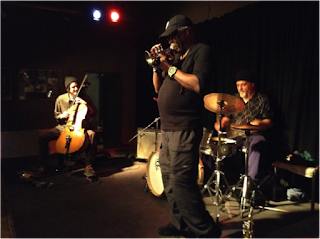 Joe McPhee was in a good mood that night. The day before the gig at the W71 club he and Michael Zerang had arrived in Europe for a short tour of eight gigs, Weikersheim was supposed to be the first one. Norbert Bach, the promoter of the W71 concerts, picked them up and they were invited to stay at the Bach’s house. Elsbeth, Norbert’s wife, cooked dinner and they had some whiskeys. Fred Lonberg-Holm joined them at the day of the gig. The audience was very welcoming, the trio had been there twice before. And McPhee had saved the rest of the whiskey from the night before backstage. What makes Survival Unit III such an outstanding band are the different musical socializations of the players (one of the last great bluesmen on reeds, a drummer with an Assyrian background and a cellist who is also linked to the alternative rock scene; the last two are also trained in classical music) and - as a result - the variety of musical means they have at their disposal: blues rock riffs, folk ditties, classic jazz themes, blurred shapes á la Albert Ayler, African tribal rhythms, abrupt changes of style, the use of electronic loops, computer game sounds etc. - and they displayed their complete set of skills in Weikersheim. The first set consisted of three pieces and the band used the first one to warm up, to find their idea for the evening, where they want to head. McPhee, who was on soprano and on pocket trumpet that evening, took the small trumpet like a whiskey jar and put it to his mouth, sucking and spitting into like an angry, greedy animal, it was like a signal for the others. The second piece was wilder, partly crass distorted sounds by Lonberg-Holm dominated the atmosphere but then he changed to a loop that sounded like a guitar played backwards and McPhee added overblown lines on the trumpet - it was a moment of mad beauty. The conclusion of the first set presented McPhee playing blues motifs on trumpet which he countered with his own voice, a reminiscence to his own musical history of the late 1960s and early 70s. But the highlight was yet to come: the 35-minute second set, in which the band pulled all the stops. McPhee, the mad master of ceremonies, challenged Zerang for a soprano/ocarina duo - it was as if one instrument was playing, creating a weird split sound. Then again, the trio very often sounded as if they were playing blues rock in a free jazz disguise, mainly Fred-Lonberg Holm was the man whose lines held the improvisations together while McPhee wasn’t playing at all for minutes. He left the field to his comrades, stomping his left foot repeatedly on the bandstand like a furious elephant. Then he started singing, hollering and crying, he couldn’t stand still, he danced as if he was in trance. Here you could see how deep McPhee is rooted in an African-American tradition, in the call-and-response structures of the field songs. He answered his shouts with short lines on the trumpet, and the band supported him with straight and tight licks. After the regular set the audience went crazy (which is all the more remarkable because it was a typical German free jazz audience, which means that it mainly consisted of men who were older than 50). Eventually, the encore proved how varied the band could play: the piece reminded rather of baroque music than of the free funk/blues set they had just played, which was surprising but also very beautiful and exciting. In a nutshell: although there are some live gigs to come at the end of this year, this might have been my favorite concert in 2015. Really wonderful to read this in the midst of the other reviews. Not surprised it might be your top gig of 2015. Sounds truly amazing.